Balby Carr Community Academy launched a dramatic second half comeback to be crowned Doncaster Schools’ Year 11 football champions. They turned a 3-1 half time deficit against Ridgewood School into a 4-3 triumph to lift the Coleman Shield. Balby have won the league and cup double the previous three years. The final was a fitting end to their football-playing careers at Balby Carr, said PE curriculum manager Shane McClune. The game started quickly with both sides trading exchanges. Some excellent work up top by Joe Cottam produced the first goal of the game, finished calmly and collectively by Curtis Mann. Ridgewood rallied and hit back with three goals in ten minutes to give them a 3-1 lead at half time. The Balby Carr side came out all guns blazing in the second half and, with nothing to lose, gave everything. An outstanding run from Dec Slater pulled Balby back into it at 3-2 and five minutes later, after a long clearance by goalkeeper Callum Fielding, Cottam used his strength to beat two defenders and level the score. Tension among the spectators grew but Balby brimmed with confidence and continued to press. Ten minutes from time the ball was played up to Cottam who chested the ball and turned beautifully to volley home from 20 yards out to complete the turn-around. Mr McClune said: “It was the greatest comeback I have ever witnessed and I want to congratulate the boys. “It was the best second half of football I have ever witnessed from our Y11s. Headteacher John Innes added: “To do what they have done is an outstanding achievement in schools’ football. Balby had earlier seen off Danum in the first round, as they ran out 3-1 winners with goals from Cottam, Slater and Mann. 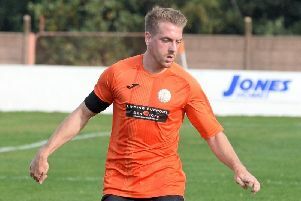 Slater, Mann and captain Kenny Sweeny scored in a 3-2 quarter-final win over Hungerhill. Balby produced another excellent performance to win 4-0 in the semi-finals against Hall Cross. The goalscorers were Slater, Cottam (2) and an own goal. The full squad is Callum Fielding, Jack Terry, Kieran Colbert, Kenny Sweeney (captain), Jack Richardson, Tyler Harrison, AJ Hall, Curtis Mann, Declan Slater, Josh Tickhill, Joe Cottam, Franck Gbohou, Ethan Slater, Jack Holbrey, Matthew Turnbull.